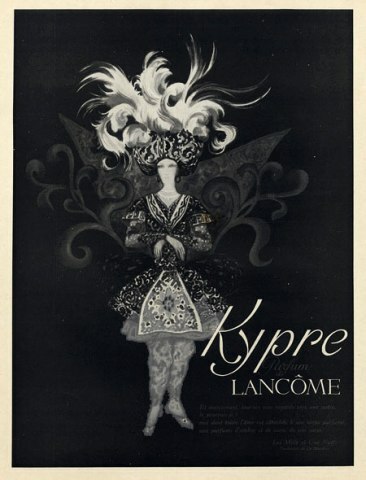 I don't know about you, but I wish that fashion magazines and ad agencies would start using illustrations again. Am I the only one who is a little tired of seeing airbrushed photographs of the same models/celebrities/it girls wearing the latest fashions or hawking cosmetics and perfume? Take the 1955 Lancôme ad, above. 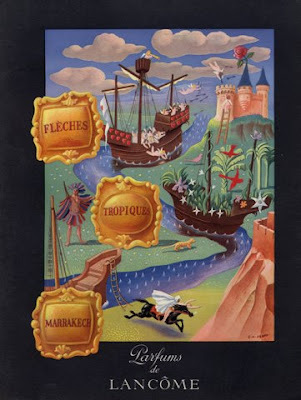 Illustrated by artist E. M. Perot, the charming ad reminds me of Tony Duquette's whimsical drawings. As much as I like Kate Winslet as an actress, I would be much more inclined to buy Lancôme products if they used illustrations like those above rather than the current campaign featuring Winslet. Rather than being old-fashioned, illustrations might actually be a novel way to advertise in 2012. You know, in an "everything old is new again" kind of way. I did a little sleuthing around the internet, and it seems that during the 1940s and 50s, Perot illustrated quite a few ads for Lancôme fragrance including Flèches, Marrakech, and Magie. I've included a few examples of his work below as well as two unusual ads that were not drawn by Perot. People collect these types of old ads and display them as art. I wonder if fifty years from now, people will be displaying Britney Spears perfume ads? I sure hope not. 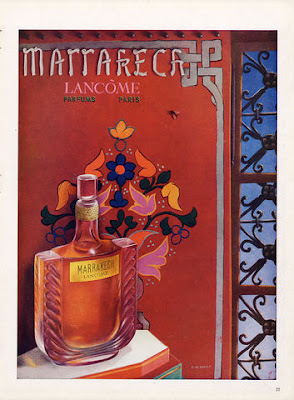 Marrakech ad from 1947; Perot illustrator. Another Perot ad for Flèches, Tropiques, Marrakech from 1949. 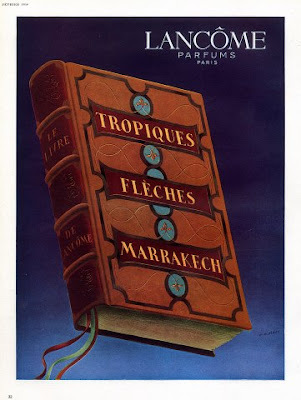 Tropiques, Flèches, and Marrakech fragrance ad c. 1949; Perot illustrator. 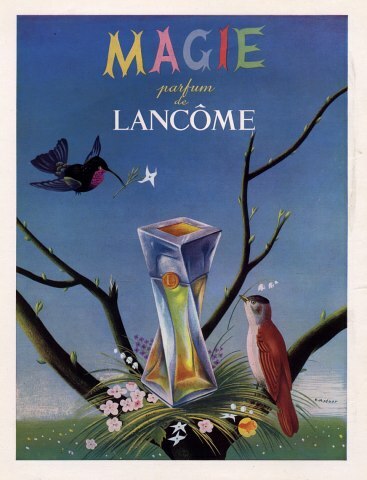 Magie ad from 1951. Perot, illustrator. Magie and Trésor fragrances, hand in hand. Ad from 1946 and drawn by Perot. Not by Perot, but this 1941 ad for Kypre is charming nonetheless. And this appears to be a photograph rather than illustration. An armor hand holding a heart (its conquest) is a rather artistic way of selling perfume. 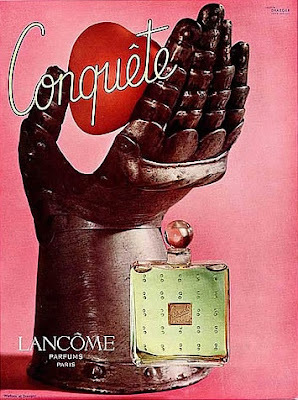 Conquête fragrance, c. 1950. 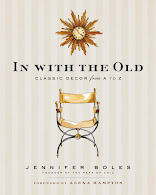 Oh I adore illustrations Jennifer, and would love to see a comeback! Parrish was a favorite of mine. Amen to this! Thanks Jennifer! The bright, floating colors give these a surreal quality that is irresistible. 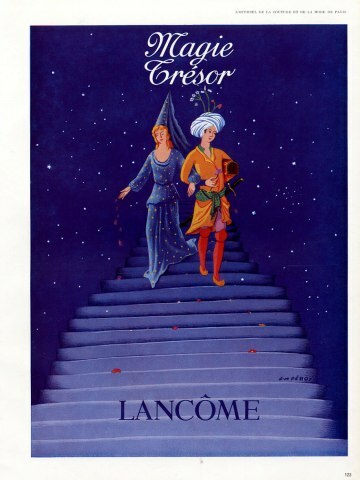 My favorite (that I have seen before) is the Diaboliques perfume ad with the hands emerging from the flame garland. My favorite here is either the Magie or the book one. Parnassus- I'm going to see if I can find an image of the Diaboliques ad. So intriguing! Adore these + love your blog. Look at the drawings of Antonio Lopez-he was fabulous! I'd love to know you think of the British artist, Francis Marshall-50 years before Sting he did a book called An Englishman in New York! and the work of the much better known, Rene Gruau? 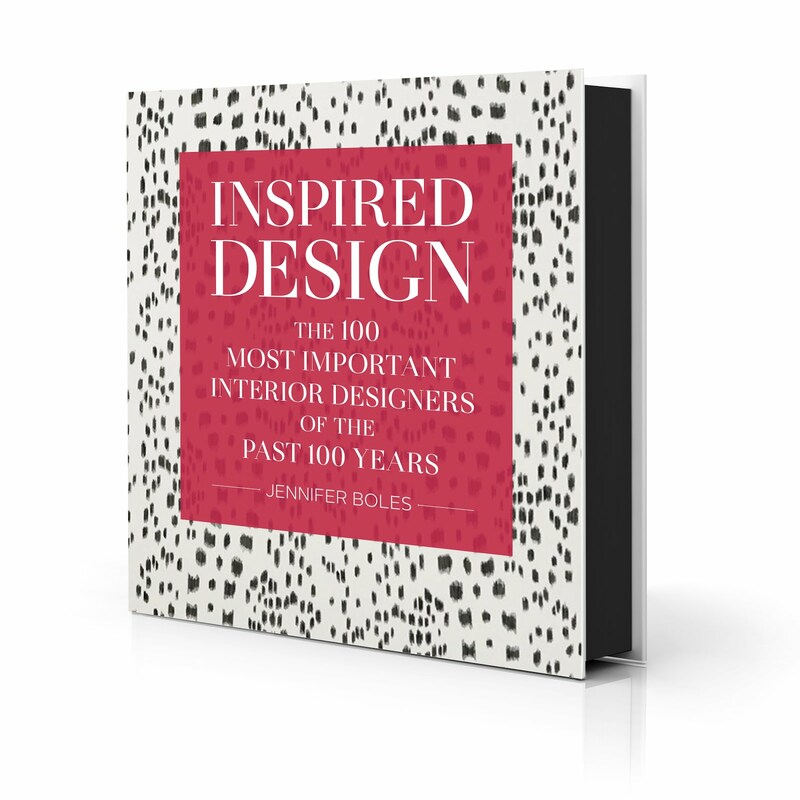 I agree -would definitely mix things up a bit to include some 'illustrious illustrations' (I love that title!). Love the post today! I have poked around the internet to see where I could buy one and I can't find a source. Did you find one in your searches? Thank you! 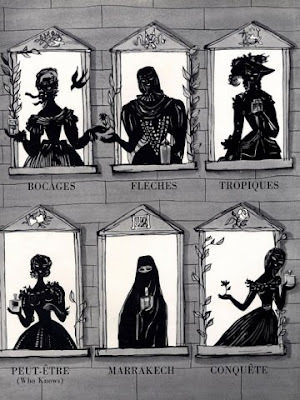 Sorry, my mistake--the ad is for Diableries perfume, not Diaboliques. I guess I was thinking of the wonderful suspense-thriller movie Les Diaboliques (naturally, the 1955 Clouzot classic, not the awful remake). My apologies if I sent you off on a wild goose chase. I am sending a copy of the actual ad to your e-mail. You might also like Schiaparelli's vintage ads by illustrator Marcel Vertès. I bought one on eBay for a few bucks. Then, when I was flipping through the The Private World of Yves Saint Laurent and Pierre Berge recently, I noticed YSL had an original illustration by the same artist. Absolutely. When did illustrations stop being used in magazines by the way? I'm thinking it was probably in the 60's; I'm assuming it was because of the cheaper cost of colour photography and printing? Interesting. I love those soft reds and greens used in late 40's printing, as in the Marrakech ads. We've never been a more celebrity hungry society than we are today, so I suppose that a majority of people would prefer to see the Jennifer Lopezes of the world in their ads rather than witty illustrations! I love these! Swann Galleries in New York is having a vintage poster sale soon, and I was just looking at all the great images and wishing more advertising was done with illustrations. It's more escapist and alluring, I think.